IF Oxnard Built An F47, Would You Come? Thread: IF Oxnard Built An F47, Would You Come? Some of you may be familiar with my epiphany about the importance of Guild's "Grand Auditorium" body in the brand heritage, after my realization that my F40-derived F65ce was the most comfortable-to-play guitar I own, even with the narrow 1-5/8" nut and 25-5/8" scale. 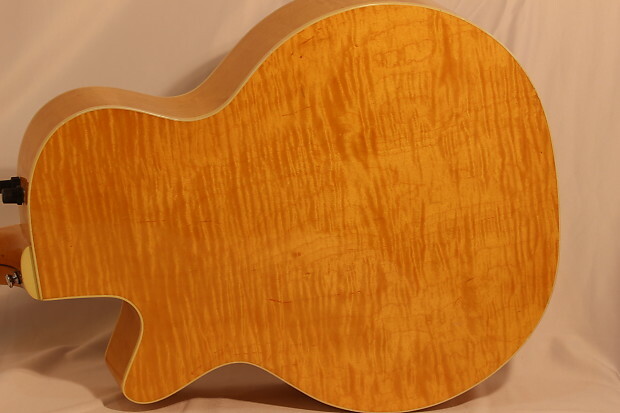 The basic F40 outline (16" lower bout "F" body, also known as "Grand Auditorium" in Taylor-speak) has yielded more variations on a theme in terms of body and top wood combinations, depth, scale lengths, and as the basis of an ongoing evolution of a cutaway electric line than any other body in the flat-top line. There may be just a few more dreadnought models but there's a lot more repetition of the traditional hog/maple/rosewood-with-sitka top combinations that really vary more by "bling" than variety of back styles or scale lengths. It's not even a Grand Auditorium body, it's a 17" lower bout F-body and is even based on the original F48 by their own admission! So I'm willing to cut 'em some slack on that if they'll revive what became the F40's first variant: the F47, which boiled down to an F40 outline with a flat 'hog back instead of arched maple. Over the years the F47 went through its own metamorphoses, yielding once again to the F40, and then to the Gruhn-designed F42/44/F46's. Read between those lines: When it was time to revamp the line where did they start? With dreadnoughts and F40's. Ultimately those Gruhn designs evolved pretty quickly into the GF series and that, in my opinion, was the golden age of Guild's Grand Auditorium offerings: In the GF's all 3 back woods were available as well as both flat and arched backs, and concurrently we saw the introduction of a cutaway electric line with an alternative scale length in the F45ce. Yeah that's what my F65ce looks like. Eventually we saw Westerly offer F47ce's in 'hog, maple, and rosewood bodies, and F47's survived even into New Hartford, by which time they were calling the original F47 formula (flat-back 'hog body) the F40. So maybe that threw Oxnard off and sent 'em down the wrong tracks. I'm getting old and I think that's what my hands want now, and I think it'll also sound mellower than my F65ce with its arched maple back. F45ce was originally arched maple back but I'm flexible there, too. I'm thinking flatback 'hog or rosewood, only because I need to get some rosewood into my collection, but I've discovered the flatback 'hog sound from my D40 continues to grow on me, and voila, all we really need is a revived F47. So how about it Oxnard, how about digging out and dusting off those old 16" body bucks and offering some special order options like a short scale with 1-11/6 nut. I couldn't even buy one used if I wanted to, and I actually tried a Taylor GA a couple of weeks ago that just didn't do it for me. What say ye, merry gentlemen, should Guild revive the F47 in all its body woods and return to leadership of the Grand Auditorium niche? If they did would you try one, maybe even buy one? Remember, they monitor the action here so make your vote count. Last edited by adorshki; 03-21-2019 at 06:03 PM. After spending most of the past 6 months cased, my Tacoma F-47R has been out of the case and on the guitar stand next to my desk for most of the past week. And it has been sounding better and better and better. To my ear it is the best sounding rosewood guitar in the herd, even better than the Orpheum. Nice. I'll have to have a fancy Guild someday. Guild from here went your way, Guild from your way came here. Cool. Any "new build" guitar (from any manufacturer) with a 1 11/16" nut and 2 1/8" sting spacing is a no go for me. That's way I am truly blessed to have acquired my NH Guild F30 Standard and NH F30R Standard with the wider nut and string spacing. That kept me from leaving the Guild family for another manufacturer. 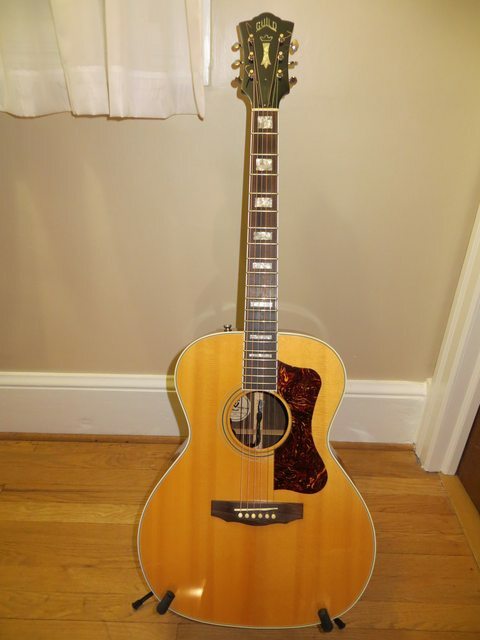 For me, my old F44 was the always the queen of my Guild collection, and is the only guitar I truly miss. 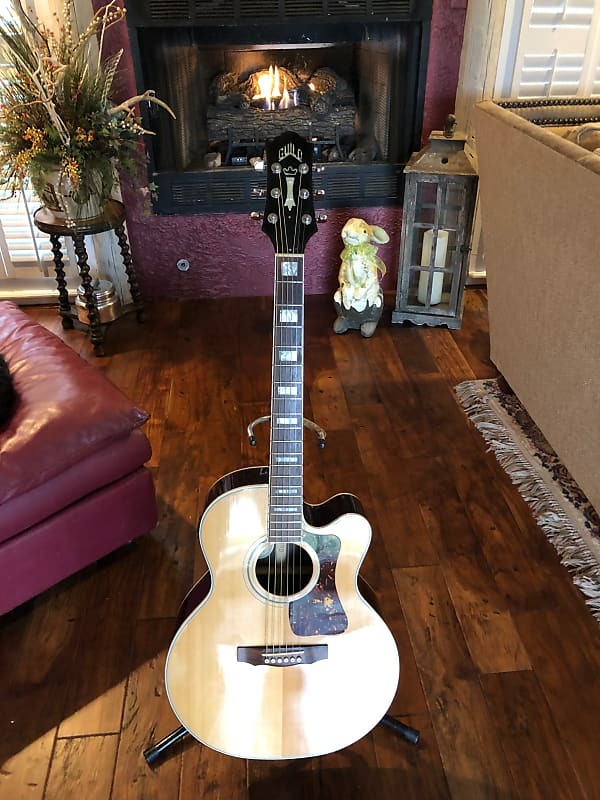 My friend had a F46 that I was allowed to use, but he refused to sell it to me at any price, as that was his queen of his Guild guitar collection. Aesthetically, I always felt that the GF / GV collection was a downgrade to the F44 / F46 line of guitars, so I never warm up to those guitars. No doubt there were many fine guitars produced in the GF / GV line of guitars. I'm not sure why you think Oxnard is monitoring posts here, Al. I kinda' doubt it. In any case, I want to clarify to everyone here that LTG is not affiliated with CMG and they have no say in what gets posted here. I very much hope that this site maintains its independence. Did you intend to create this thread as a poll, Al? That's an option, and might've served better here. I might be able to turn this into a poll if you want it that way, just let me know through PM what you want. I'm not sure though. Anyway, the answer from me is no. The re-introduction of the F-50R and F-50 (under new names, I know) provides the appeal to me. The truth is that, post-divorce, I can't afford any of these and wouldn't sell my axes to get them. Finally, I really *do* hope they bring this model back though. I acknowledge its appeal and I hope to see it return someday. ... with a new model number of course. If it was a pretty close reissue of the horsey pickguard mahogany F-47, maybe. That's a really good point but I'm absolutely positive I've seen reference to the fact that they do "look in" here, perhaps "monitoring" wasn't the right word because it implies an active continuous process, and I agree don't think they watch that intensively. More than anything else the remark was just supposed to be a set-up for the "Vote early and Vote often" humor chestnut. As for actively participating, no, at least not "officially" (who knows if they may have members here who simply don't disclose an affiliation with CMG for entirely ethical reasons,) and at least partly for exactly the reasons you mention. Did you intend to create this thread as a poll, Al? That's an option, and might've served better here. Nope, didn't want a dry old poll, wanted actual owner/prospective owner feedback like seen so far. And btw, @ Tommy: I only want to be able to special order the oddball scale length/nut combo, I get why 25-5/8" is preferred in the niche. 'AT's what I'm lookin' for! BAD Ralph, Bad Bad Ralph!! With my luck they'll call it an F30. Now that I think about it I'd live with it and let the F30 lovers start to gripe, as long as it was a GA body! Last edited by adorshki; 03-21-2019 at 06:37 PM. I love my early 2000's F47BRZ that Chris Fleming made in the Corona Custom Shop but it is of the Mini Jumbo 16" body style like the late Westerly models as opposed to the Tacoma and New Hartford Body Shape. I tried several New Hartford and one Tacoma F47 models in tone woods of Maple, Rosewood, and the GSR Koa version. They sounded good but just didn't do it for me. The Tacoma and NH versions are almost like a cross between a Jumbo and a Dread and that was noticeable in the tone aspects as you could hear characteristics of both when you play them but the overall impression was they were a bit thin sounding to me. Not that they aren't a cool guitar but personally they just didn't have enough in the tank for my tastes. Just an opinion as always. 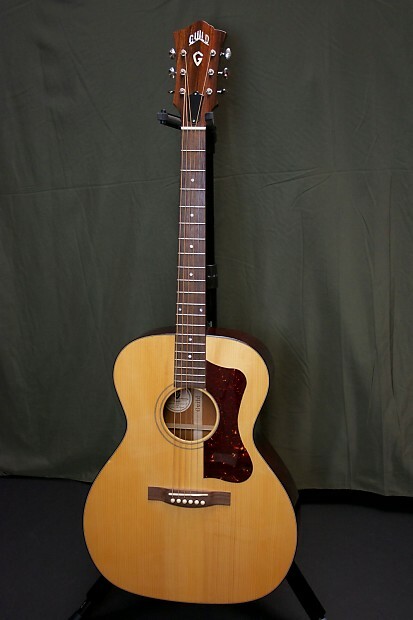 if we are talking about bringing back a F-312 Model then I might have to take a chance on an Oxnard made Guild.